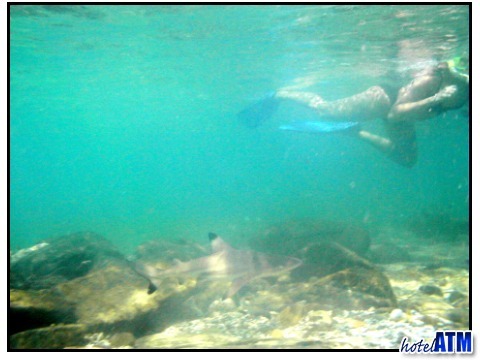 It is fair to say that snorkeling with the sharks is one of Phi Phi Islands most dramatic underwater adventures. To come face to face with prehistoric Black Tip Shark is something many fear in their worst nightmares and so the expectations and the adrenaline are very high. As you enter the water for the first time on a Shark Watch Tour, the instinct is to get right back in the boat but you have to calm down and win over your own emotions. The simple truth is the Black Tip Reef Shark is not dangerous and is very timid. If you splash and or some say show fear, the Black Tip reef shark swim away at speed. If you are able to calm your senses you can be surrounded by a couple of sharks as they are inquisitive. The Shark Watch tour goes off in small groups so as not to scatter the sharks and the tour guide takes you through the what to do list. The Shark Watch Tour is one few forget and many place in their all time top tropical moments.